Malpas Village Hall is located on the western side of Malpas village. Classes and events take place in either the St Andrews Hall, a sensitively refurbished old church building, or the slightly smaller Barton Hall which was completed in 2013. Both halls are linked by a connecting corridor and are fully accessible. They can be booked and used separately or together, as occasion demands. There is a small kitchen area in the Barton Hall which is equipped with facilities for wheelchair users. 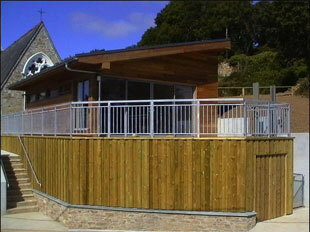 There are bus services from Truro to Malpas Village that are ideal for getting to the Malpas Village Hall. Details of services can be found in the Information section of this web site. Only the Barton Hall has a kitchen, so book this room if you need to prepare refreshments. If you want to know about forthcoming special events, or to take part in the regular classes, clubs and activities which take place each week, go to the 'What's On' section where you can find out how to join a class or club. You are welcome to come along to our coffee mornings and special events and we are happy to see new faces at our clubs and classes. However, you will need to check with individual activity organisers to see whether there is space available and to put your name down.